The most conspicuous material in Titia Ex’s work is light. Light has a huge symbolic significance, with references to happiness, spirituality and, enlightenment. Titia Ex’s new work, The Walk was created in collaboration with Philips and the Light Art Centre in Eindhoven, Netherlands, for the light event, GLOW. 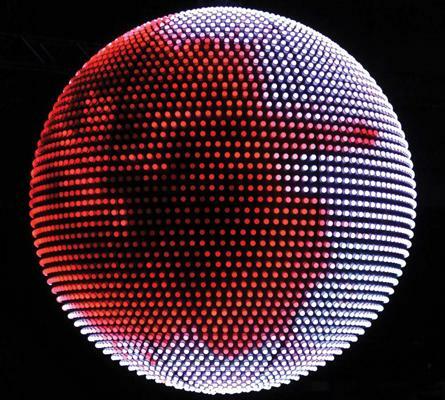 The Walk is a huge, 2.5-meter diameter sphere, comprising 5,000 pixels with a total of 35,000 LED lamps. The intense, red glow of the lamps in Ex’s globe produce an enthralling variety of colour and movement. The spherical shape and its change of light and colour give the impression that it is a rotating orb. An illusory story unfolds based on Dante’s Divine Comedy of the journey from Inferno to Purgatorio, giving a sense of catharsis and the transition from fire to light. Flames and figures with torches appear through ghostly imagery like a non-stop procession towards the after-life. The viewer is invited to enter the procession, to approach the sphere and to walk around it without ever getting away from its light. In this form of interaction between spectator, space and object, visitors are not only spectators absorbed in a play of light and imagery but they are also participants, in a journey in search of light as, in methexis, walking from Hell to Purgatory, a journey to the underworld. Visitors follow the rhythm of the work; en route to somewhere else, the two are in synchronisation, giving this rhythm, a trance-like echo. Titia Ex’s work has been commissioned for many pubic spaces throughout the Netherlands including, Natural History Museum, Frankfurt and Utrecht Central train station.